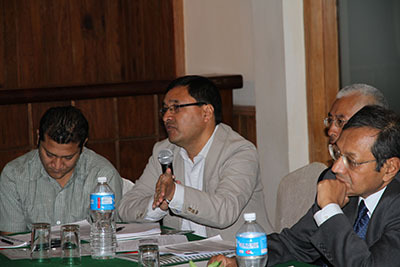 In May Conservation Strategy Fund and World Wide Fund for Nature - Nepal (WWF Nepal) held a one-day policy forum on biodiversity conservation and infrastructure development. 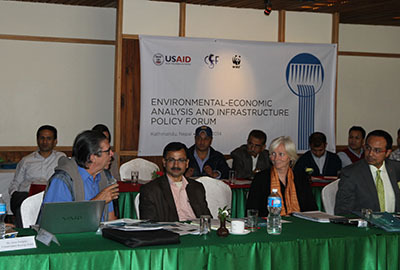 The forum covered environmental economics and policy tools used to integrate conservation and infrastructure plans in Nepal. 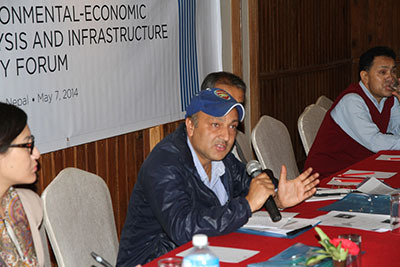 The discussion focused on how infrastructure planning and decision-making could be improved across the Himalayan Region. Dr. Krishna Chandra Paudel, Secretary of Nepal’s Ministry of Science, Technology and Environment, specifically addressed the need to comprehensively evaluate infrastructure projects and policies at the national level. The event was part of a multi-year global partnership on Biodiversity Understanding in Infrastructure and Landscape Development (BUILD) between CSF and the US Agency For International Development (USAID). The forum included a clinic on economic tools for infrastructure planning and development, followed by sessions on infrastructure policy best practices and Nepal's infrastructure development plans. 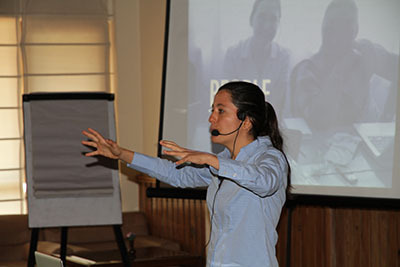 During the clinic, WWF’s Christy Williams presented a case study entitled, “Mitigating Effects of Linear Infrastructure on Wildlife Survival in India,” and CSF’s Irene Burgués discussed cost-benefit analysis (CBA) concepts and techniques. Burgués also highlighted the methodologies used on various case studies and presented the results of CBAs conducted on a road network in the Selva Maya, a hydroelectric complex in Panamá, and a hydroelectric project in Guatemala and Mexico. 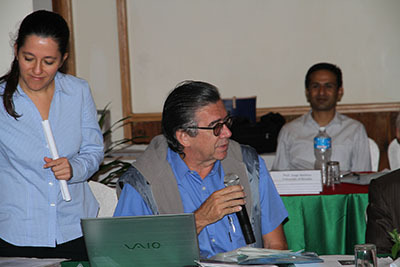 Additionally, South Asian Network for Development and Environmental Economics’s (SANDEE) Rajesh Kumar Rai also demonstrated the uses of evaluating environmental services and presented a valuation case study conducted in Nepal’s Chitwan National Park. Sessions on policy best practices were led by CSF experts, including Jorge Nogueira Madeira and Burgués. Nogueira Madeira presented lessons learned from Brazilian infrastructure policy and Burgués, discussed key findings from an analysis of policies to reconcile infrastructure, conservation and gender concerns, conducted by CSF in collaboration with the Environmental Law Alliance Worldwide (ELaw). During the Nepal Infrastructure Development session, Tika Limbu from the Asian Development Bank (ADB) presented ADB’s plans for infrastructure development within the country. 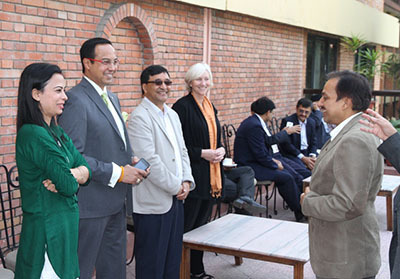 Pyush Dogra of the World Bank discussed the bank’s strategies for green growth, and WWF’s Santosh Mani Nepal highlighted the potential effects of some major infrastructure projects in Nepal. The sessions were moderated by: Nepal’s Secretary of the Ministry of Forest and Soil Conservation; the Secretary of the Ministry of Science, Technology and Environment; and the Deputy Director General of the Department of Roads, Ministry of Physical Infrastructure and Transport. Overall, the forum gave investors, development planners, journalists, representatives from environmental NGOs and development agencies the opportunity to discuss evaluation, mitigation and policy tools that can be implemented to optimize the economic performance of infrastructure projects. 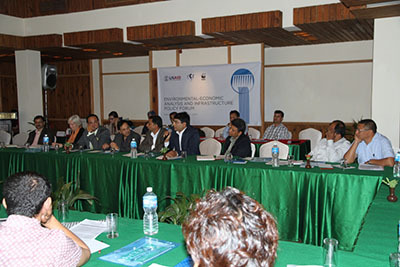 This forum was made possible through the support of the American People through the United States Agency for International Development (USAID) and in collaboration with the Asian Development Bank, World Bank, and Nepal’s Ministry of Physical Planning and Work, Ministry of Science, Technology and Environment, and Ministry of Forest and Soil Conservation. Thanks also to WWF Nepal for its event coordination, specifically Jagadish Parajuli and Santosh Mani Nepal.